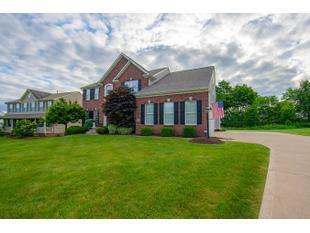 Luxurious living awaits you in this well-appointed Cranberry Township home. This meticulously maintained home provides almost 4,800 sq ft of livable space with a great lot that takes advantage of the scenic wooded views. As you enter the two story foyer, the warm and inviting color palette is complimented by the hardwood floors which beckons you to explore the open floor plan. The main level offers 9' ceilings, a formal living & dining room with trey ceiling and ambient lighting. Across the entry is a private den with French doors. As you move further in, the home gourmet will be delighted by the kitchen's upgraded cabinetry & the sea of granite that makes up the counter tops and back splash. The morning and family rooms are open to the kitchen and this layout truly creates the heart of the home as you relax from the day or plan what you'll discover with the close proximity to area attractions. The main level has a laundry room and a powder room for convenience. As you make your way to the second level, the intricate moldings and open staircase invite you to explore the second level owner's suite. Behind the double doors, a private oasis awaits you. The boutique style hotel colors, trey ceiling, private sitting room, dual walk-in closets and a spa-inspired bath will provide you with peace and tranquility at the end of the day. Additionally, there are three spacious bedrooms and a full bath on this floor. The walk-out finished basement boasts a home theater area, game room, full bathroom and another private space that could serve as a fifth bedroom/office/craft room. To ensure energy efficiency, the dual zoned HVAC will keep you comfortable throughout the changing seasons. The entertainer will appreciate having a whole house audio system, A+ curb appeal, and a low-maintenance newer deck overlooking the mature lot. Directions: Rte 19 S to R on Old Rte 19, R onto Glen Eden Rd, L onto Unionville Rd to Broadview Court.